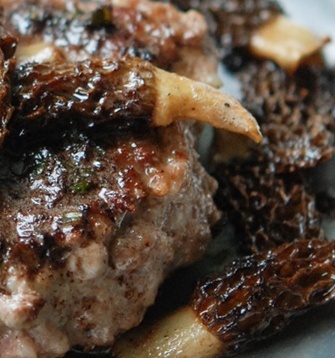 Morel mushrooms are a ball to find and these morel recipes are quite a find too. Fried morels are my favorite. 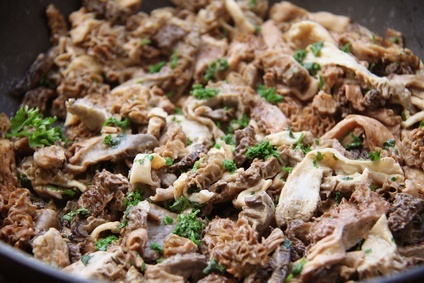 I also offer a Morel sauce recipe that is very versatile and a delicious Morel and Pork recipe; all below. In April and May here in Wisconsin, the "professional mushroom hunters" are found searching streams and the woods after a warm streak. Common conversation is "Did you find any?" The answer is "yes" (but without a location). 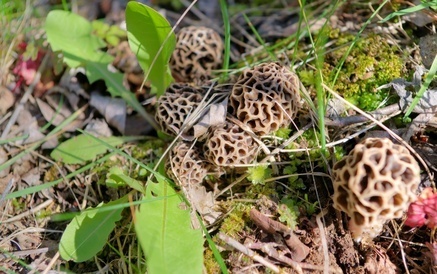 Morels are commonly found by American Elm trees and you will find white, yellow and black morels depending on the time you go hunting. Morel season begins as early as the beginning of March (sometimes even late February) in Texas and the Gulf states, and in May in Canada (where the season sometimes doesn't end until well into June). You will also find these by Sycamore, Ash, Apple trees, Cottonwood and White Pine. I know when I have gone morel hunting, I searched around trees and not seen anything. When I look at the same area in a different angle; I find several. Go figure. The first thing I would do is cut off the flared ends that are covered with dirt. I would then rinse the mushrooms to get off the excess dirt and place them in a large bowl of salted water to soak. I usually soak them for 20 to 30 minutes. Don't do it any longer than that. The salt water will also bring the bugs out of the mushrooms. Drain and let them dry. I slice them vertically to fry. You may fry them two different ways. One if rolling in flour only and frying - the second is using an egg wash. I will give you both recipes. I really don't give an amount of morels for these recipes. Usually you fry up most of them right away. Get your butter in a heavy skillet and place on medium high. After rinsing the salt water off the morels just place a few in the bag and shake to completely coat. Place in the hot skillet and fry until golden brown. Turn over and repeat. You may season them with salt and pepper after they are cooked. Drain on paper towel and eat immediately. First you would place the morels in the flour bag #1 and shake to cover completely. Dip these morels in the egg wash and shake in flour bag #2. Place on a piece of foil and let dry for 15 minutes so the coating doesn't fall off. Fry them until golden brown on one side, flip and repeat. Season with salt and pepper when done. Note: Some of you may not want to slice the mushrooms, but I like it that way. Remember, it's totally up to you. Meanwhile to prepare sauce: In a heavy skillet, saute morels in butter until they are slightly brown. Add onions and continue to saute until onions are golden and transparent. Sprinkle with flour and stir to blend. Add the half & half, stirring occasionally, simmer until thick and creamy. Add the Worcestershire sauce, garlic and onion powder, salt and pepper to taste. 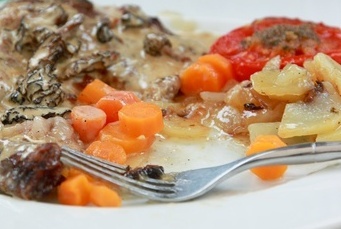 Above is a image of Steak with Morel Mushroom Sauce. 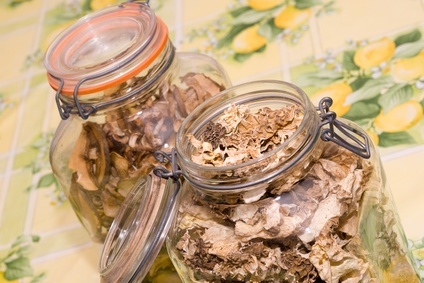 How do you dry morel mushrooms using an dehydrator? It really is easy to do and they keep well too so you can enjoy them year- round. Pick the same size morels to be dried on each level. The smaller ones will come out first, so you may want to put the tray on top. Or you may just slice them so they are approximately the same in size. Make sure they are clean and dry (you may roll them in a paper towel to get the water out of the crevices). Arrange on the dehydrator tray like you would for other food; don't let the pieces touch each other. Dry at approximately 125 degrees until crispy - 4 hours for small pieces and up to 8 hours for large pieces. Allow to cool completely before storing in an airtight glass jar. To use them year-round, just pour boiling water over them and let them soak for 15 to 30 minutes. You can put them directly in soups or stews without doing this. Preheat your oven no higher than 150 to 175 degrees. Place the cleaned morels on the baking tray and let dry for 2 to 3 hours. Open the oven door and let mushrooms cool completely. Then store in an airtight jar. Some folks keep them for years, but I would be certain to check them every couple of months for mold or discolorations. 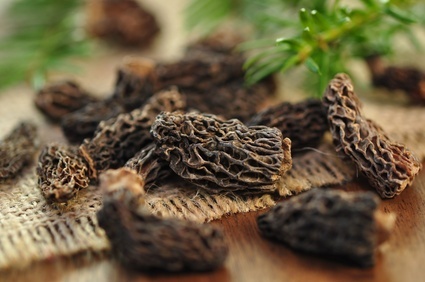 Use them just as you would fresh morel mushrooms. Enjoy! Freezing morel mushrooms is easy too. Again, clean them well and slice in half. There is one extra step that one must do before storing them in the freezer. You may freeze them whole or sliced in half; that's up to you. But here is the extra step; you must cook them until they are almost ready to eat. Not half done, but almost done. The way to get them to this point is using one of three methods below. You need to add 1 teaspoon of lemon juice to the water when blanching. 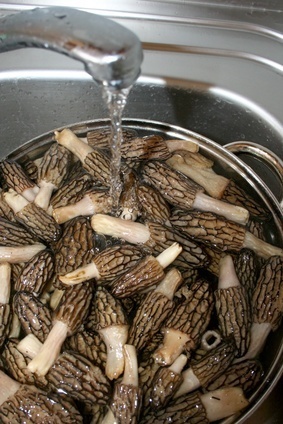 Blanche Method: Place clean morels in boiling water that has 1 teaspoon of lemon juice in it. For the sliced pieces, you would blanche them for 3 minutes and for whole morel mushrooms it will take 5 minutes. Steam Method: Place clean mushrooms in lemon juice for 5 minutes. Steam sliced mushrooms for 3 minutes and whole mushrooms for 5 minutes. Saute Method: Saute small amounts in frying pan until almost done. Cool mushrooms immediately and drain. They can be frozen plain or you may prepare them as you would for frying. 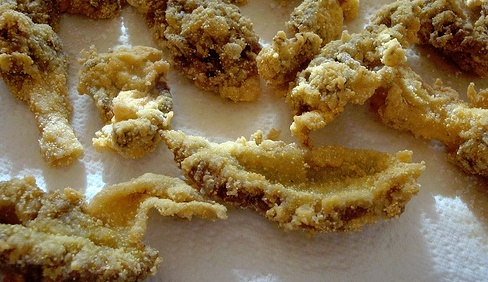 Dip morels in egg wash and roll in flour or bread crumbs and place them on cookie sheet (fried morel recipes above). Freeze them on the cookie sheet and then you may bag them. I would use these up within 60 days because of the egg. If you have dried morels available, this would be a recipe to use them up. Add shallots, garlic and morel mushrooms to hot olive oil. Saute for approximately 10 minutes. Cut the butter into 6 pieces and add each one after the previous one has melted; making a buttery sauce. Sprinkle with parmesan cheese and garnish with chopped parsley. Additions: 1 cup frozen peas. Just be sure to add 1/4 cup water to the mixture before adding the butter. This isn't really a morel recipe. But do you know what else would be good with fried morel mushrooms - a juicy hamburger! You may use the first two recipes above to fry the morels. I would grill the hamburger and top it with the mushrooms and some of the butter that the morels were fried in. You may even top the burger with a slice of Swiss cheese and then place the hot fried morels on top.